Today's Feature Friday highlights one of many nifty RepairShopr features, developed specifically to help you save time and stay organized in your shop(s). 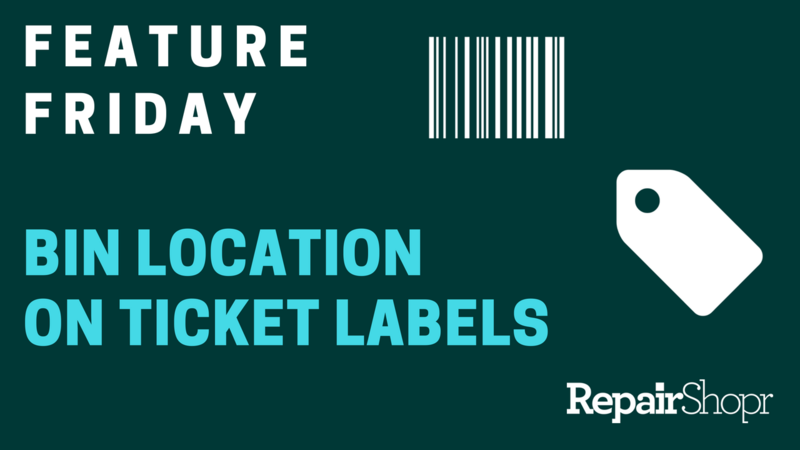 With the help of RepairShopr's "bin location" feature, you can input a storage location to Ticket labels and attach these labels to devices and/or device-related items, in order to better track where these items are located in your shop(s). This is useful if your shop uses a bin or other type of storage system to keep devices and/or device-related items organized, such as paperwork or device accessories. This way, if something is misplaced, the Ticket label will note the item's proper storage location. Log into your RepairShopr account and make your way over to Ticket Custom Fields. Decide which Custom Fields you think would benefit from item location tracking via Ticket labels. Click "Manage Fields" on any one of your choosing to create your first "Bin" custom field. Click the "New Field" button in the upper right-hand corner of the page and name the item "Bin." Be sure to mark the Field Type as "Text Field" and make the field required if you wish to (we recommend this). Click the "Create Ticket Field" button to save. Now, as you create Tickets and select a Custom Field type with the "Bin" field enabled on it, you will be able to fill-in the Bin field with whatever storage location you've deemed appropriate for the item. As you view/print the Ticket label, the Bin field will appear with the location you added! We hope you enjoyed learning about this nifty feature, and look forward to hearing what you think!